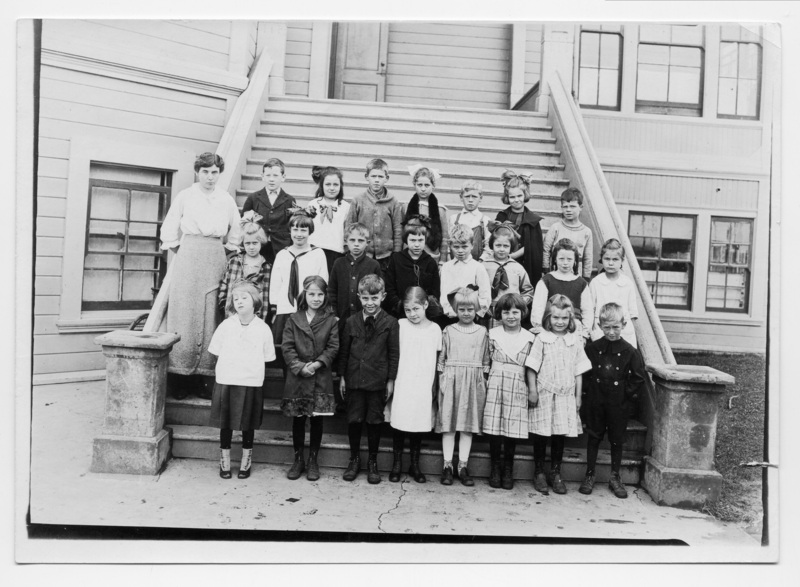 Teacher: Miss Lillian Bickner [probably Irma Vose]; Top row: Wm. Wanker; Constance ___; Norman  Bake ___last in row Elmer Hill; Second row:  __; Roma Confer; Robb Nordmark; __ Thomas? ; Ava Bickner; ___; Wanda ? ;  First row:  Juanita ? ; ___; ___; ___; Josephine? ; Marjorie Ranger; ___; Vern Larson. Old Oswego School. Description Scanned as B & W; tear on right side. Same as 352a & c, but names different on the back. Transcription Teacher: Miss Lillian Bickner [probably Irma Vose]; Top row: Wm. Wanker; Constance ___; Norman Bake ___last in row Elmer Hill; Second row: __; Roma Confer; Robb Nordmark; __ Thomas? ; Ava Bickner; ___; Wanda ? ; First row: Juanita ? ; ___; ___; ___; Josephine? ; Marjorie Ranger; ___; Vern Larson. Old Oswego School.